A telephone tower in Stockholm, Sweden, with 5000 connected lines. 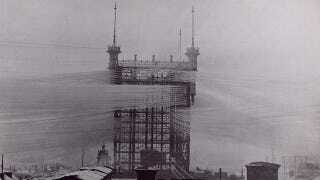 It was used between 1887 and 1913, but the tower stood there until 1953, when it fell down after a fire. A New York street during the blizzard of 1888, which occurred between 12th and 14th of March and paralyzed the city with 40" of snow and winds up to 60 mph, creating some 50 ft high drifts.